If you thought dinosaurs were extinct, then think again! They live on in the stomping, chomping, growling, howling poems in this collection. So if you're looking for poetry with a prehistoric twist, look no further than this sensational selection. The collection is put together by John Foster and illustrated with creative genius by Korky Paul. 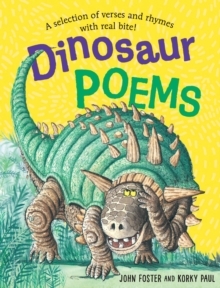 There are poems by a range of authors about all kinds of dinosaursfrom dancing dinosaurs to dinosaurs in the park. Guaranteed to delight, this is a perfect introduction to poetry either at home or at school.